Take a stone circle and a boy and girl dressed in old-timey clothes playing at the circle. Mix with an old mansion that has a history. Add a surprise or two. Stir, and you end up with a mystery, a girl’s dream, and a seemingly impossible romance. Sarah Shand loved the stories her grandmother told about Weetshill mansion. She knew that someday she would live there. The problem was, the mansion was old and falling down and no one had lived there since the 1950’s. Sarah still believed, however, as only a nine-year-old could believe. Fast forward ten years. Distraught over her breakup with her boyfriend, Sarah runs away to the mansion, where she swallows sleeping pills, passes out, and awakens in a different time and place. 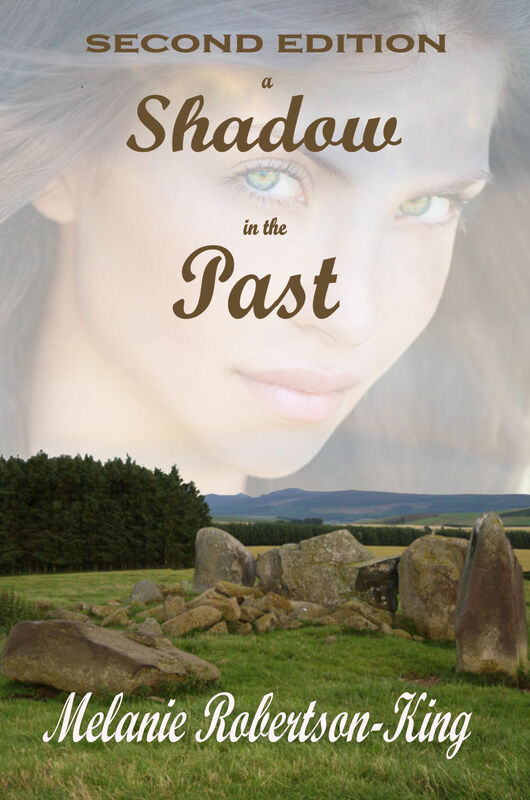 Author Melanie Robertson-King’s debut YA novel, A SHADOW IN THE PAST, is not only a time travel story, it’s also a story of love, family, and making choices. The author takes the reader back to a simpler time period, the Victorian era, where people dress and talk differently, and where Sarah certainly does not belong. Or does she? I thought the storyline was quite unique and interesting to follow. I can only imagine how hard it must have been for Sarah to suddenly be trapped in the wrong century. I especially liked the little “snippets” from ancient Scotland that Melanie mentioned. I never knew that being left-handed was seen as a devilish gesture. (Heidi @cosmochicklitan) You can read the entire review here. A Shadow in the Past is the ultimate romance fantasy that every girl has dreamed of at some point in her life. (Nikki @BestChickLit) You can read the entire review here. A Shadow in the Past is an enjoyable historical, time-traveling romance novel set in Victorian Scotland. I won a signed copy from the GoodReads FirstReads program, along with two lovely bookmarks! (Nikki Goodreads Giveaway Winner) You can read the entire review here. A 19-year old student in 2010, Sarah Shand, in northeast Scotland, is miserable. Her beau cheated on her with her best friend. Her sister has a date with a hunk, and her parents are in her face. She storms from the house, heading for the circle of stones, her refuge, to do the unthinkable. She’ll show them! Stumbling around in the dark, she’s struck by a car. Suddenly things change. Found on Robert’s doorstep, injured, and confused, she wants only to go home. But, ‘home’ isn’t where it’s supposed to be, leaving her even more confused. In denial over what has to be the only reason everything is so strange, she finally comes to terms with her new reality. It’s 1886 and she’s alone in this strange world. Robert, the young, handsome Laird, her host, is the only reason she’s even still alive. As her memories of her old life fade, she’s caught up in her new, and different life amidst changes in Robert’s life that affect her. Suddenly, she’s gone – kidnapped and sent to an asylum. She and a new friend – a child – escape, while Robert searches for her. Separated, they each realize they love the other, but don’t yet know how the other feels. Finally reunited, their love grows. Later, after numerous dangers and trials, Sarah is given a chance to return to her time? Will she? What about Robert? And, what of the child? A Shadow in the Past is an enjoyable read for young adults! Set in Scotland in both the present time period and the late 1800s made for an engaging story. Sarah, left heartbroken by her boyfriend and her best friend, longs to escape her life. Well, she gets her wish, sort of… You know that saying,”Be careful what you wish for”? Well, initially that’s how it feels to Sarah, who is now stuck in the 1800s and has no idea why. Then her feelings start to grow for Robert, the handsome, kind, wealthy young man who opens his home to the confused, hurt, and scared 19 year old Sarah. Great idea to put your review on your site. I might have to try that. Yours sure sound good.